I have over 14 years of working experience in maternal & new born health, obstetrics and gynecology and reproductive health at acdemicia&non-acedmecia organizations assuming different positions & roles. 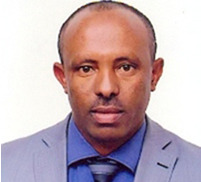 I have got MD degree in 2001, speciality certificate in obstetrics and gynecology in 2008 from Addis Abab university, Ethiopia and masters in public health in 2011 from University of Gondar, Ethiopia . I have played pivotal roles in national strategic document develeopments in reproductive health of Ethiopia. I have played leadership role at different postions in different organizations. I have published few articles, served as reviewer of abstrcts for the 3rd international family planning conference and national annual society meetings and chaired scientific sessions in meetings and conferences. Currently I am a senior maternal and new born health advisor at John Snow Inc. in Ethiopia leading the maternal and new born health intervention within the integrated family health program. I am also the honorary secretary of the Ethiopian society of obstetricians and gynecologists (ESOG). 2)cervical cancer and its prevention. 1.Amare B, Abdurrahman Z, Moges B, Ali J, Muluken L, et al .Surgical site infections among inpatients of Gyn/Obs and surgical wards, NW Ethiopia. Journal of Bacteriology & Parasitology 01/2011; 2(8):126-130. 2. Birhanu Sendek Getahun, M.D., M.P.H., Melisachew M. Yeshi, M.D.,and Drucilla J. Roberts, M.D. Case 34-2012: A 27-Year-Old Woman in Ethiopia with Severe Pain, Bleeding, and Shock during Labor. The New England Journal of Medicine,2012: 367:1839-1845. 3. Birhanu S., Getu Degu, Telake Azale. Breast self examination among female employees of Gondar University with special reference to health belief model, Unpublished (presented at annual conference of the Ethiopian society of Obstetricians and gynaecologists, January 28, 2012). 4. Yohannis Fitaw, Amsalu Feleke, Getu Degu, et. al. Module on safe motherhood for the Ethiopian Health center team, April 2005.